U.S. Rep. Maxine Waters, D-Los Angeles, will soon stand trial before the Office of Congressional Ethics over charges that she improperly requested a meeting with Treasury officials for OneUnited Bank. Her husband owns stock in the ailing bank and served as a director until just a few months before Waters took her controversial actions. Extensive media coverage has focused on OneUnited’s success at getting an infusion of TARP money, which prevented her husband’s bank stock from becoming worthless. A more private Waters family business interest has generally escaped the media’s recent attention. Federal campaign records reveal that, since 2005, Congresswoman Waters’ campaign committees have paid more than $350,000 – and currently claim to owe another $82,000 – in management fees to an entity known as “Progressive Connections.” Don’t bother looking online for detailed information about Progressive Connections, as this firm doesn’t aggressively advertise. Records reveal that Progressive Connections is the fictitious business name used by Maxine Waters’ daughter, Karen Waters. Rep. Waters has for many years operated a slate mail business that personally benefits her daughter. In each election cycle, Waters releases a voter guide featuring her picture and a list of candidates she endorses and ballot measures she supports. Candidates and ballot measure committees pay to be listed on the guide. Until the 2004 election, Karen Waters ran the operation through a state committee called L.A. Vote. Starting with the 2004 cycle, Maxine Waters’ federal campaign committees have taken responsibility for collecting the checks from candidates appearing on the guide. They also pay the bills for producing and mailing the guide. Every cycle, one of the largest bills is Karen Waters’ management fee. Sometimes it’s the largest bill. The Waters committee confirmed in an FEC report just weeks ago that the operation has continued right up through the 2010 primary season. Indeed, the June 2010 primary saw huge payments by a few candidates to appear on the voter guide. Although some contend that Waters is merely exploiting a loophole in the law, analysis of a Federal Election Commission advisory opinion issued to the Waters Campaign – and the Waters campaign disclosures filed after the opinion – raises several questions. Among them: Have the Waters committees complied with the FEC’s instructions and regulations about how they were supposed to collect money from the candidates appearing on the guide, or are some candidates paying more (and some less) than the rules allow? Do the timing and size of the management fees paid to Progressive Connections comply with the FEC opinion? And, since state and local candidates and committees are paying into Water’s federal campaign account to appear on the guides, might the Waters campaign be using any corporate money to fund this operation? Conceding that the operation may have been entirely lawful at the time, Levine nevertheless wrote that “there is something unseemly in the way the Waters family uses her political clout to advance its financial interests.” After this flurry of negative press, the operation appears to have flown under the radar, likely due to the perception that it had received a clean bill of health from the Federal Elections Commission. The Waters campaign apparatus took the voter guide operation “in house” starting with the 2004 election cycle. Payments for appearing on the voter guide would now be made to Waters’ campaign committee instead of L.A. Vote, and the committee would pay for the postage, printing and other expenses associated with producing the voter guides. Along with this change in approach, Waters sought an advisory opinion from the FEC. One of the stated purposes of Waters’ request was to gain an understanding as to whether payments by candidates appearing on the guides should be treated as campaign contributions to her. Interestingly, the Waters team described the voter guide operation in prospective terms (e.g., “Congresswoman Waters . . . intends to produce and distribute a sample ballot”) (emphasis added). They made no mention of the procedures used to collect money in prior election cycles. Rep. Waters made no reference in the publicly available communications about any anticipated payment of “management” fees to Karen Waters via Progressive Connections, nor did she disclose the practice of collecting large checks from committees supporting state and local ballot measures. In response, the FEC “conclude[d] that reimbursements by the authorized committees of the Federal candidates listed in the brochure in amounts equal to the attributable costs associated with each candidate’s listing would not constitute support of the Waters Committee . . . because, in this situation, mere reimbursement of the costs associated with the production and distribution of the proposed brochure within a reasonable period of time would not constitute ‘anything of value’ to the Waters Committee” under federal election laws. (FEC Advisory Opinion 2004-37, p.4, October 21, 2004) (emphasis added). In plainer English: Waters was supposed to get reimbursed for the costs apportionable to candidates based on the space allocated to them in the voter guides and based on the number of voter guides on which the candidates appeared. If this were really happening, one would expect to find in Waters’ FEC reports that her campaign was making the voter guide expenditures before the candidates “reimbursed” her. Likewise, one would expect that these reimbursements would not be made in round number amounts, since the actual proportionate costs would rarely, if ever, calculate exactly to even amounts like $5,000 or $10,000. Last, but not least, any “profit” or “subsidy” resulting from campaigns paying more than their actual share of the costs had to be treated as a contribution to Waters. Another potential landmine lurking in the Waters’ FEC correspondence relates to the collection of money from California state and local candidates and committees. Unlike federal candidate committees, these state committees can accept donations from corporations. The Waters team told the FEC that, “[s]ince the ballots will be paid for and distributed by either the Congresswoman’s principal campaign committee or her leadership PAC, in no event will any costs of the sample ballot be paid with non-federal funds.” That may be literally true since Citizens for Waters was writing the checks, but what about the “reimbursement” from the state and local candidates and committees? In their original request for the opinion, the Waters team asked a series of questions relating to this potential complication, but the FEC’s opinion never addressed them. One payment in the 2008 cycle could raise eyebrows. The Waters committee reports receiving a check for $25,000 on May 9, 2008, from “Alliance for California’s Tomorrow” (“ACT”) for its “Share of Mailer.” Likewise, the California Secretary of State’s records show ACT – whose full name is “Alliance for California’s Tomorrow, A California Business Coalition” – making the same check on the same date. According to the state records, however, ACT was also receiving money from corporations in the days just before the May 9 payment to Waters’ federal committee, including a $50,000 contribution by Anthem Blue Cross on May 1. Corporations continued giving to ACT in the days and weeks after the payment to Waters, including a $45,000 contribution by Philip Morris on May 14. It is a fundamental tenet of the federal campaign finance system that corporate donations are not permitted. If, in fact, the donation from ACT (or any other state committee or candidate eligible to receive corporate money) truly represented the proportionate cost associated with the voter guide, it could potentially be dismissed as no big deal. If, on the other hand, payments from state or local committees exceeded the proportionate cost attributable to their share of the voter guides, the regulators may take a different view. The Waters campaign team told CalWatchdog that state and local committees paying to appear on the voter guide are asked to verify that they are using permissible funds. Multiple follow-up calls to the campaign to ask about the ACT contribution were not returned. Given ACT’s receipts, it is unclear how it could have provided such a verification. So, in ACT’s case, why did it pay the $25,000 to Citizens for Waters? In a filing with the California Secretary of State on May 22, 2008, Waters’ committee disclosed that this payment supported state Senate Candidate Rod Wright, who was then locked in a primary battle and went on to become senator for California’s 25th District. As for whether this represented a proportionate share of candidate Wright’s space on the voter guide, it’s worth noting that Assembly candidates Mike Davis and Warren Furutani each paid only $2,300 to appear. Did The Old Ways Really Change? As for the nuts and bolts of what the FEC did address, has Waters followed these instructions? The campaign contends that, in fact, it is conducting a proper “time and space” allocation as instructed by the FEC. A detailed review of the campaign reports suggests that the actual voter guide operation may more closely resemble the operation described by The Times, where payments are made based on ability to pay, rather than the operation as assumed by the FEC in its opinion, where candidates would “mere[ly] reimburse” the committee based strictly on their proportionate share of the voter guide’s costs. 2004 Cycle. The FEC didn’t issue its opinion until October 21, 2004, just 12 days before the November 2004 election. It appears from Waters’ campaign disclosures that she was not collecting checks for her mailer until immediately after the opinion was issued, and it was a light year by historical standards. The committee collected less than $90,000 for the November voter guide. The Friends of Barbara Boxer committee paid $25,000 for what the reports describe as Senator Boxer’s “Share of Mailing.” This was by far the largest contribution by an individual candidate, however. According to federal reports, the next closest payment for an individual candidate was $5,000. The disparity raises the question whether the “time and space” allocation that Waters assured the FEC would take place just a few weeks earlier actually occurred. Another practice from the 2004 cycle stands out, and it gets repeated in future cycles. According to Waters’ FEC statements, she began collecting checks from candidates in even amounts ($1,000, $5,000, $10,000) several days before her biggest expenditure for the voter guide – a printing bill of $42,723. It is difficult to characterize these prepayments as “reimbursements,” and the round numbers further call into question how these amounts could have been determined, in advance, based on allocable costs that had yet to be incurred. 2005 Cycle. 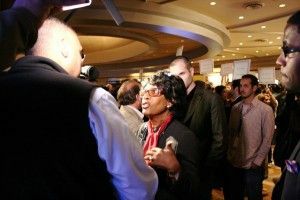 For the 2005 local elections in Los Angeles, the Waters team ran the voter guide operation through “People Helping People,” the Congresswoman’s federal “leadership committee.” In state and federal filings, People Helping People confirmed receipts of $79,500 for the slate mail operation. This committee helped Progressive Connections too, paying it $30,500. The next closest reported slate mail expense was a printing bill for $22,137. 2006 Cycle. The voter guide business improved in 2006. According to federal disclosures, Citizens for Waters collected nearly $300,000 from candidates and initiative committees to appear in the mailers. (State records reveal a slightly higher amount collected.) The checks were again paid in round four- and five-figure numbers. And, as in 2004, several of the payments were collected before the major postage and printing fees were incurred. With increased revenues came increased expenses, including management fees. The committee reported writing checks to Progressive Connections in the amount $80,000 on August 29, 2006. It listed a debt to Progressive Connections for another $102,000 in unpaid management fees in its 2006 year-end report – $232 more than the committee reported as its cash on hand at the time. Only a few thousand dollars trickled into Citizens for Waters for slate mail expenses (including $15,000 from “Clean Money Now”) in 2007, yet the committee reduced its slate-management debt over the course of 2007, with payments to Progressive Connections of $50,000 in February and $23,500 in July. All of which raises the question: Whose contributions actually paid that debt? When asked how the fees to Progressive Connections were calculated, the campaign stated that the fees were based on work performed. Further detail was not provided. Curiously, the Waters committee also listed “overpayments” by a few of the local candidate and initiative committee donors in its report following the 2006 general election. This suggests the committee may have been conducting some kind of allocation analysis for the 2006 cycle. However, these overpayments covered only a small portion of the total number of candidates, which begs the question why all candidates appearing on the guide were not due some amount of money (or owe additional money to Citizens for Waters) as one would expect from a complete “squaring up” of all costs. If time and space allocations were actually taking place each cycle, moreover, one would expect to see similar adjustments occurring cycle after cycle. 2008 Cycle. The voter guide business remained strong in 2008, collecting over $300,000 in total proceeds. The disparity among candidates making payments appeared to widen. For example, Waters’ federal reports show that supervisorial candidate Bernard Parks paid $25,000 for each of the primary and the general. As noted above, ACT paid $25,000 to promote state Senate candidate Wright. Meanwhile, according to Waters’ reports, the Richardson for Congress campaign paid only $2,300 to appear on the primary mailer.. Regulators may be interested in reviewing whether these payment disparities match up with the appearance of the actual voter guides. In five payments between April 2008 and January 2009, Citizens for Waters paid Progressive Connections a total of $111,500. 2010 Cycle. The floodgates opened in the 2010 primary season. Disclosure reports confirm that Citizens for Waters has collected more than $230,000 for the primary voter guide. The disparities in amounts of payments into Citizens for Waters also remained very wide. For example, FEC records reveal that San Francisco Mayor Gavin Newsom, a candidate for California lieutenant governor, swamped all of his fellow endorsees when his committee paid $45,000 to Citizens for Waters on June 3, 2010. The next closest were San Francisco District Attorney Kamala Harris (running for attorney general) and Assemblyman Dave Jones (running for insurance commissioner), whose committees each paid $25,000, according to state and federal reports. Sen. Barbara Boxer returned to the voter guide in this cycle with a far smaller payment of $5,000. In its most recent filing, dated July 15, 2010, Citizens for Waters confirms that it had paid Progressive Connections $33,000 in May and June 2010. It lists a current obligation to pay Progressive Connections another $82,000 for its management services. Since Citizens for Waters reported holding more than $192,000 in cash at the close of the last reporting period, it is possible that some or all of this $82,000 obligation has been paid in recent weeks. Bradley Benbrook is an attorney in Sacramento. He handles government investigations and disputes, election law matters, and business litigation.